Chris Heywood made it back to back $30,000 Parkes Services Club Parkes Cups when Class Clown won on Sunday after the Wagga Wagga based trainer had won the 2017 Cup with Leucura. Greg Ryan rode the now retired Leucura while it was Chris Heywoods’ son, Nick Heywood, in the saddle on Class Clown. Away quickly, Class Clown ($3.80) led throughout over the 1600 metres for a convincing win from Annecy (Eleanor Webster-Hawes, $11) and Beau Hoffa (Courtney Van Der Werf, $8.50). Feature sprint, the $25,000 Parkes Services Club Satellite Handicap, (1200 metres) saw a brilliant win for the Chris Heywood trained Fermanagh Lad (Michael Travers, $4) which led all the way to score by nearly eight lengths from Epic Dan (Greg Ryan, $3.70 favourite) and Superoo (Jamie Gibbons, $7). First leg of a treble for the Chris Heywood stable was Delivered ( Grant Buckley,$3 fav.) in the Parkes Farm Centre Benchmark 65 Handicap, 1300 metres. The popular Parkes trainer George Wright was in celebration mood after a highly successful weekend which started on Saturday with wins at Cobar with Stravali and at Quambone with Choppa and culminated with a winning double, Midnight Serenade and Got Nothing at the Parkes Cup TAB meeting on Sunday. After tracking the leading pair,Midnight Serenade (Tony Cavallo, $2.80 fav) took control to win by almost three lengths from the impressive debut maker Opera Dude (Kath Bell-Pitomac, $9.50) and Who Told Ya (Nick Heywood, $3.50) in the Parkes Telescope Tyres & Batteries Maiden Handicap, 1000 metres. Got Nothing (Nick Heywood, $6.50) came from midfield to beat Zeta’s Rocket (Kath Bell-Pitomac, $2.50 fav) with Ausbred Petal (Grant Buckley, $61) third in the 1000 metres D’Aquinos Liquor Benchmark 59 Handicap to complete the George Wright double. 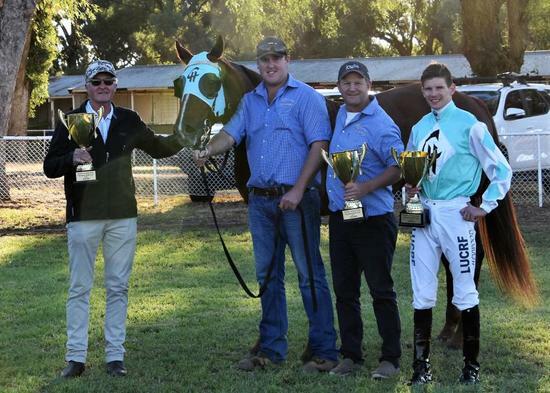 Cowra jockey Mathew Cahill rode winners at Dubbo (Sunday), Alice Springs Cup (Monday), Canberra (Wednesday), Scone (Friday) and backed up to win the Tony’s Windscreens Maiden Plate (1400 metres) on Sunday at Parkes aboard the Cameron Crockett, Mudgee trained Invincible Type ($3.40). Cameron Crockett has now trained the winner of the opening race at four successive meetings – Dubbo, Coonabarabran, Dubbo and Parkes. Not long back from injury, Cowra jockey Michael Travers completed a winning double when the Norm Gardner, Canberra trained Empyrean ($15) finished fast from well back to win the Bugman Class 2 Handicap (1600 metres) while another Canberra trainer Nick Olive won the Parkview Motor Inn Class 2 Plate (1200 metres) with Fire Stoker (Richard Bensley $2.60 fav) which led most of the way. Parkes will next race on the Saturday of the June long weekend.